Can be used as joined or split reins. 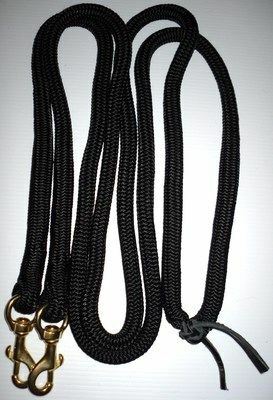 Doublebraid rope is extremely strong, so these reins have been made with a safety breaking point. This is particularly important if using rope reins for jumping, cross country etc or with young or excitable horses, where it is quite possible for a horse to get a leg through the reins if you part company! The ends of the reins have been backspliced to form two small loops through which a leather thong is threaded. They can be used as split reins (important if teaching your horse to ground tie) or as joined reins by threading the thong through the loop and tying to form a neat join. If your horse gets a leg through the reins the leather thong will snap. This can easily be replaced by more leather thonging, or any other suitable fastening that will break under pressure.